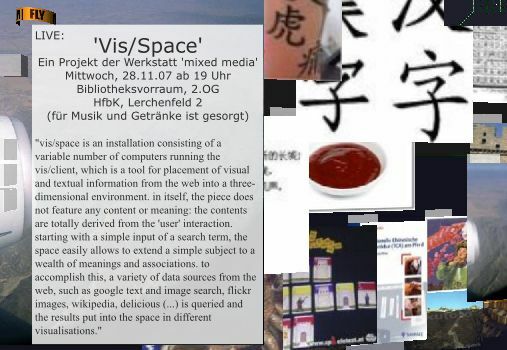 "vis/space is an installation consisting of a variable number of computers running the vis/client, which is a tool for placement of visual and textual information from the web into a three-dimensional environment. in itself, the piece does not feature any content or meaning: the contents are totally derived from the 'user' interaction. starting with a simple input of a search term, the space easily allows to extend a simple subject to a wealth of meanings and associations. to accomplish this, a variety of data sources from the web, such as google text and image search, flickr images, wikipedia, delicious (...) is queried and the results put into the space in different visualisations."